A large 20-acre flat area near Briones Reservoir has been selected by the East Bay Municipal Utility District for a 5-megawatt renewable energy project. Known as the Duffel Site, the photovoltaic energy project will see the installation of single-access tracking solar panels that will reduce EBMUD's carbon footprint in Orinda to zero. The project will have less than one acre of hardscape and will be shielded from view by landscaping. The area, which is currently owned by EBMUD, is very close to a PG&E substation, so there will be only a short distance over which the energy will be transported. The site would mainly be visible from Bear Creek Road and Tappan Lane, which is one mile from the site. 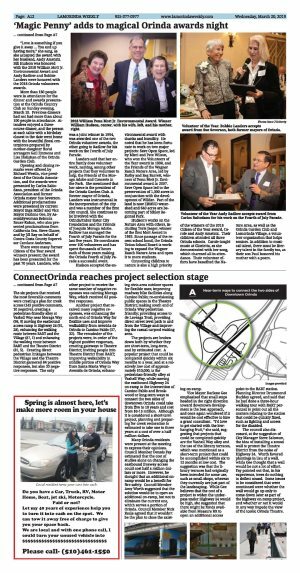 Although the project would annually produce an equivalent amount of energy to support 20 percent of Orinda, there will be no direct benefit to the city of Orinda. 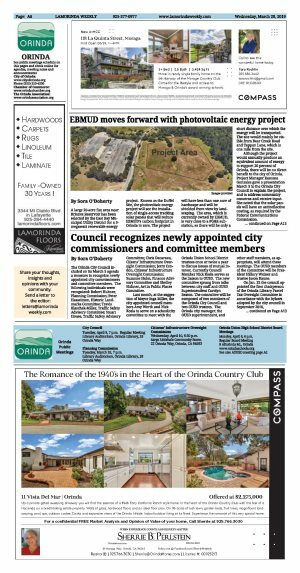 Project Manager Ramona Gonzales gave a presentation March 5 to the Orinda City Council to explain the project, and to address community concerns and receive input. She noted that the solar panels will have an antireflective coating, as required by the Federal Communications Commission. Council Member Dennis Fay expressed concerns about fire safety, and Mayor Inga Miller agreed that wildfire is of paramount concern. Gonzales replied that the solar tracker technology now allows EBMUD to use the smallest possible area to generate electricity. Nick Waranoff suggested that perhaps EBMUD would consider waiving the rent that Orinda pays the utility for use of the Orinda Sports Fields. One speaker asked where the direct current from the panels will be converted to indirect current. Another suggested that inverters produce noise, which could be a concern. EBMUD will need to file a permit to be reviewed by the Planning Commission. This will be followed by a public meeting, hosted by EBMUD, to receive community input. Following that meeting, EBMUD will incorporate the input received and then complete California Environmental Quality Act requirements with EBMUD as lead agency. Construction is expected to begin in 2020 and the site is expected to be operational in 2021.